This was how the Association of American Railroads described their product known as The Railroad Hour, in their annual publicity pamphlets. 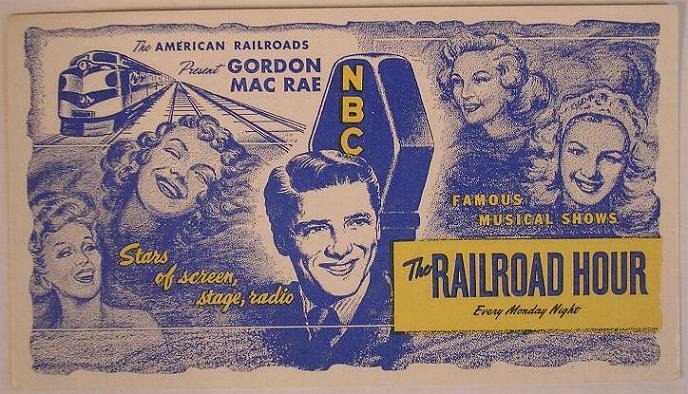 For 45 minutes every Monday night, over the American Broadcasting Company’s national network, the American Railroads presented, for listener enjoyment, one after another of the world’s great musical comedies and operettas… the top-rated successes whose names had been spelled-out in the blazing lights on both sides of Broadway. Complete with music and words, the program offered famed headliners of the stage, screen and radio taking the leading roles. Highly favored by Joseph McConnell, President of the National Broadcasting Company, and William T. Faricy, President of the Association of American Railroads, The Railroad Hour competed against such radio programs as CBS’s high-rated Suspense and The Falcon in the same weekly time slot. The program lasted a total of 299 broadcasts over a span of six broadcast seasons—an accomplishment some would consider impossible by today’s broadcasting standards should the program be dramatized on television. 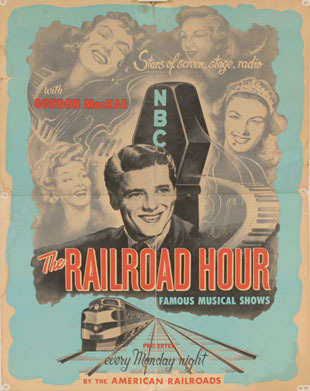 The Railroad Hour was broadcast from the studios of the National Broadcasting Company in Hollywood, California. The program was heard regularly over 170 stations of the NBC network. According to an annual report issued by the Association of American Railroads, it was estimated that the program was heard by more than four million family groups. “Musical shows with a dramatic continuity are enjoyed by persons of all ages, especially when the leading roles are portrayed by outstanding artists. All members of the family, as well as school, church, and club groups, find The Railroad Hour wholesome, dignified, and inspiring entertainment,” quoted Francis Van Hartesveldt. So why is the program called “Hour” when it was on the air only thirty minutes? In radio, the term “hour” was indicative of the time of the beginning of the broadcast, rather than the number of minutes the program was on the air. Also odd was the fact that the program ran a mere 45 minutes instead of 30 or 60 during the opening months. 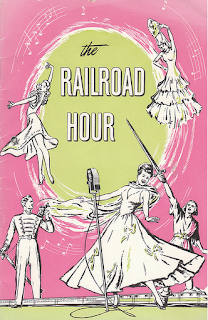 During its half-hour on the air, The Railroad Hour gave its listeners 25 minutes of entertainment. About two-and-a-half minutes were given to the railroad message. The remaining time was required for opening and closing announcements and station identifications. 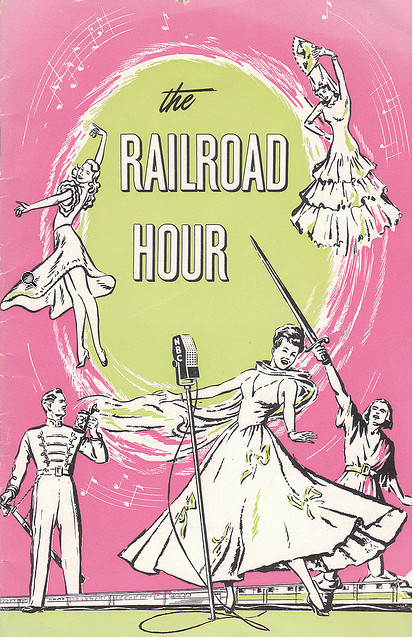 The Railroad Hour did not broadcast any operas, contrary to popular belief and reference guides. The producers of the series presented operettas and musicals, leaving the operas for other programs, namely The Metropolitan Opera broadcasts. So what is the difference between opera and operetta? An opera is an art form consisting of a dramatic stage performance set to music in which the dialogue is sung, rather than spoken. An operetta is a musical performance where the conversations are “talked” and the expressive moments are set in song. 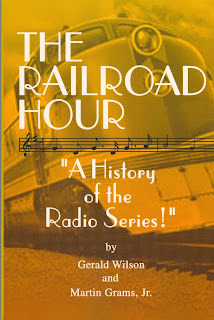 One question came up during a standard question-and-answer session with the Association of American Railroads: “Are recordings of The Railroad Hour broadcasts available?” The formal answer from the Association was that copyright restrictions did not permit the producer of The Railroad Hour to make any recordings of the musical program available to the public. However, recordings of many of the song hits heard were available at music stores. This, of course, was the formal public statement. In reality, every broadcast of The Railroad Hour was recorded and transcribed. Numerous copies were made for both legal and historical purposes. Jerome Lawrence and Robert E. Lee, who wrote the majority of the scripts, actually kept a copy of almost every broadcast for their personal collection. These discs were later donated to the Billy Rose Theatre Division of the New York Public Library for the Performing Arts located at Lincoln Center in New York City. The Library of Congress presently stores a copy of all the discs in their archives. Dealers and collectors specializing in recordings from the “Golden Age of Radio” have come across similar depositories over the years and, thankfully, more than half of the broadcasts are presently available from dealers nationwide. Marvin Miller, the announcer for The Railroad Hour, saved a few of the scripts, which were later donated to the Thousand Oaks Library in California. 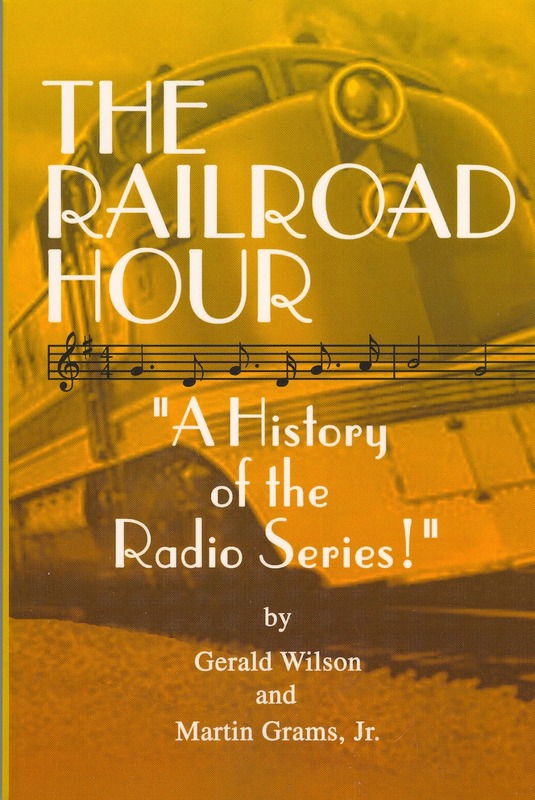 Due to music rights, The Railroad Hour has not been released commercially, but it has been made available unofficially through collector hands. A limited number of free admission tickets for the public were available for each Railroad Hour broadcast. Tickets could be obtained by writing to the Association of American Railroads, Transportation Building, located in Washington, D.C., or by writing to the National Broadcasting Company in Hollywood, California. The Applicant was required to give the date for which the tickets were desired and the number of persons in the party. Because of the demand for tickets (especially since they were free), it was publicly advised to request them several weeks in advance of the broadcast. During the 30-minute period The Railroad Hour was on the air, more than 600 passenger and freight trains departed from their starting terminals and more than 600 arrived at their destinations. In each half-hour period, day or night, the railroads received for shipment around 2,100 carloads of freight and delivered the same number of carloads of freight to destinations. They performed the equivalent of transporting 30 million tons of freight one mile and 2 million passengers one mile. They received for handling between 8,000 and 9,000 express shipments and 664,000 pounds of United States mail. For each 30-minute period of the day and night (equal to the time The Railroad Hour was on the air), the railroads paid out $50,000 for federal, state and local taxes; more than $100,000 for fuel, materials, and supplies; and more than $250,000 in wages. Among the millions who listened to Gordon MacRae and his supporting cast on The Railroad Hour each Monday evening was the daughter of Victor Herbert, the world-famous composer whose operettas had been among the most widely-acclaimed productions on The Railroad Hour. 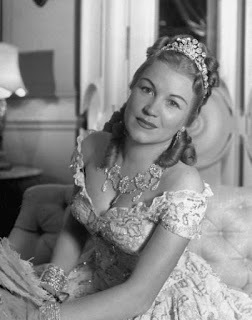 The composer’s daughter, Mrs. Robert Bartlett, who resided in New York City, had written the Association of American Railroads commending Gordon MacRae and other stars for their excellent work and expressing her great interest in the programs. The railroad salute to musical appreciation was expressed years before Mrs. Bartlett’s kind comments arrived at the Association’s doorstep. In Eleanor Early’s book, New York Holiday (1950), she tells of the death of Stephen Collins Foster, the celebrated songwriter and composer. A friend of Foster’s bought a cheap coffin on the Bowery and went to the depot to make arrangements to send the body to Pittsburgh, Early related. When officers of the railway company learned that the coffin was for Foster, they ordered a special car, heaped the coffin with roses, and carried the remains to Pittsburgh without charge. The program was first broadcast over ABC from October 4, 1948 to September 26, 1949. Beginning October 3, the program moved to NBC where it remained until the summer of 1954. All of the 45 minute broadcasts heard over ABC exist in recorded form. Less than half of the 30 minute broadcasts heard over ABC exist in recorded form, and this is very sad. (We'll explore the NBC seasons in a future blog post.) Because some of the musicals were performed more than once, some unscrupulous mp3 dealers have been duplicating existing recordings and labeling them with alternative dates. As a result, listeners and collectors today mistakenly believe what they are hearing is the recording listed on that file. Since all of the 1948 broadcasts are known to exist, what follows is a list of all the 1949 broadcasts that are not known to exist in recorded form (all of them aired on ABC except the November 14, which was NBC). Use the information contained below as a guide. If you think you have any of the "lost" episodes, please verify using the information provided. For example: if you think you have the May 16, 1949 broadcast of "Robin Hood" with Lucille Norman, listen carefully to the anouncer. The May 15, 1950 version with Dorothy Kirsten is known to circulate in collector hands. You might not have the 1949 "lost" version. Cast: Constance Collier (female role), Gordon MacRae (Fred Graham), Patrice Munsel (Lois Lane), Lucille Norman (Lilli Vanessi), The Sportsmen Quartet (backup singers), and Carleton Young (Bill Calhoun). Music for The Railroad Hour conducted by John Rarig. Based on the musical of the same name, which premiered at the New Century Theatre on December 30, 1948. Music score and lyrics by Cole Porter, based on the book by Bella and Sam Spewack, with the title taken from Petruchio’s last command to Katherine in Shakespeare’s The Taming of the Shrew, upon which this musical is loosely based. Songs include: Always True to You in My Fashion (Munsel and Young); Were Thine That Special Face (MacRae); I’ve Come to Live It Wealthy in Padua (MacRae); Wunderbar (Norman and MacRae); and Why Can’t You Behave? (Munsel and Young). Cast: Whitfield Conner (Little John), Jerome Cowan (the Sheriff), Gordon MacRae (Robin Hood), Lucille Norman (Maid Marian), and The Sportsmen Quartet (backup singers). Based on the operetta of the same name, which premiered at the Standard Theatre on September 28, 1891. Music score by Reginald De Koven, with book and lyrics by Harry B. Smith, adapted from the legend of Robin Hood and His Merry Men. Songs include: Brown October Ale (Conner); Though it Was Within This Hour We Met (Norman and MacRae); Sir Cavalier (Norman); Tinker’s Song (Cowan and chorus); and Oh, Promise Me (lyrics by Clement Scott, sung by Norman). Broadcast May 23, 1949Series subtitle: The Railroad Summer Show. Cast: Edward Arnold (Sportin’ Life), Gordon MacRae (Porgy), Lucille Norman (Bess), and The Sportsmen Quartet (backup singers). Based on the folk opera of the same name, which premiered in Boston on September 30, 1935 and at the Alvin Theater on October 10, 1935. Music score and lyrics by George and Ira Gershwin and DuBose Heyward, with book by DuBose Heyward, adapted from his 1925 novel Porgy, and the play by DuBose and Dorothy Heyward. Adapted for The Railroad Hour by Jean Holloway. Songs include: I Got Plenty O’ Nuttin’ (MacRae); It Ain’t Necessarily So (entire cast); Oh Bess, Oh Where’s My Bess? (MacRae and chorus); Summertime (cast); and Bess, You is My Woman Now (Norman and MacRae). Broadcast May 30, 1949Series subtitle: The Railroad Summer Show. Cast: Sam Edwards, Gordon MacRae, Jeanette Nolan, Lucille Norman and The Sportsmen Quartet. Written exclusively for The Railroad Hour, and not based on an already staged musical. Songs include: I Love You Truly; Once More I Sit; Just a Wearing For You; God Remembers; Baby, Baby; and End of a Perfect Day. Broadcast June 6, 1949Series subtitle: The Railroad Summer Show. Cast: Gordon MacRae (Curley McLain), Lucille Norman (Laurey Williams), and The Sportsmen Quartet (backup singers). Based on the musical of the same name, which premiered at the St. James Theatre on March 31, 1943. Music score by Richard Rodgers, with book and lyrics by Oscar Hammerstein II, adapted from the 1931 stage play Green Grow the Lilacs by Lynn Riggs. Songs include: An Sylvia, D.891; Fischerweise, D.881; Ave Maria; Be Still My Beating Heart; Wanderers Nachtlied, D.768; Thine Being My Heart; and Du Bist Die Ruh. Broadcast June 13, 1949Series subtitle: The Railroad Summer Show. Cast: Gordon MacRae (Stephen Foster), Lucille Norman (Mary), and The Sportsmen Quartet (backup singers). Written exclusively for The Railroad Hour by Lawrence Lee. Songs include: My Old Kentucky Home (MacRae); Camptown Races (Norman and chorus); Old Folks at Home [a.k.a. Swanee River] (MacRae); Come Where My Love Lies (Norman and MacRae); Jeannie with the Light Brown Hair (MacRae); Oh! Susanna (entire cast); Old Folks at Home (reprise with entire cast); and Beautiful Dreamer (entire cast). Broadcast June 20, 1949Series subtitle: The Railroad Summer Show. Cast: Gordon MacRae, Lucille Norman, and The Sportsmen Quartet. Written exclusively for The Railroad Hour by Jean Holloway. Songs include: Moonlight Becomes You; Going My Way; The Day After Forever; Swinging on a Star; and a medley of songs from Connecticut Yankee. Broadcast June 27, 1949Series subtitle: The Railroad Summer Show. Songs include: Wheels Are Rolling; Gone to Chicago (by Meredith Willson); On Top of Old Smokey (traditional song); The Lonesome Train (by Owen Bradley); Home on the Range (by David Guion); Flora Dora medley (from the musical Sing Out the News); and Beyond the Blue Horizon (by Richard Whiting). Broadcast July 18, 1949Series subtitle: The Railroad Summer Show. Cast: Tony Barrett, William Johnstone, Gordon MacRae, Lucille Norman and The Sportsman Quartet. Based on the Broadway musical of the same name, which premiered at the New Amsterdam Theatre on June 3, 1931. Music score by Arthur Schwartz, with lyrics by Howard Dietz and George S. Kaufman. 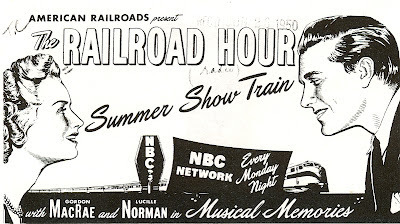 Songs include: A New Song Up in the Sky; High and Low; I Love Louisa; Dancing in the Dark; and Inside U.S.A.
Broadcast July 25, 1949Series subtitle: The Railroad Summer Show. 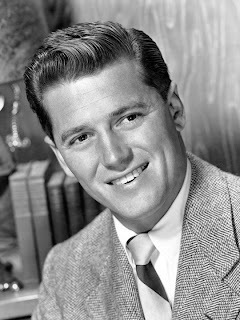 Cast: Gordon MacRae, Ken Mann, Lucille Norman and The Sportsmen Quartet. Songs include: All or Nothing at All (by Jack Lawrence); Sleepy Serenade (by Lou Singer); I’ll Remember April (by Al Hoffman); Heartaches (by Al Hoffman); Piccolo Pete (by Phil Baxter); Farewell Song (by Dorothy Stewart); and Dance with Me (by Leo Edwards). Broadcast August 8, 1949Series subtitle: The Railroad Summer Show. Cast: Gordon MacRae (Tommy Albright), Ken Mann (Jeff Douglas), Lucille Norman (Fiona McLaren) and The Sportsmen Quartet. Based on the musical production of the same name, which premiered at the Ziegfeld Theatre on March 13, 1947. Music score by Frederick Loewe, with book and lyrics by Alan Jay Lerner, partially inspired by the story Germelhausen by Friedrich Gerstacker. Songs include: Brigadoon (MacRae and chorus); Waiting for My Dearie (Norman and chorus); Down on McConachy Square (chorus); The Heather on the Hill (Norman and MacRae); I’ll Go Home with Bonnie Jean (entire cast); Come to Me, Bend to Me (entire cast); There But For You Go I (MacRae); Almost Like Being in Love (MacRae); and Brigadoon (reprise with entire cast and chorus). Broadcast August 22, 1949Series subtitle: The Railroad Summer Show. Cast: Harry Bartell (Private Stanley), Gordon MacRae (Shep Dooley), Lucille Norman (Kay Hudson), Ted Osborne (Captain Constock) and The Sportsmen Quartet. Based on the musical revue of the same name, which premiered at the National Theatre on April 18, 1946. Music score and lyrics by Harold Rome, with sketches by Arnold Auerbach and Arnold B. Horwitt. (Producers were Herman Levin and actor Melvyn Douglas). Songs include: Call Me Mister; When We Meet Again; Military Life; Along With Me; Going Home Train; Yuletide, Park Avenue; South America, Take It Away (Norman); and Body and Soul (preview of next week’s broadcast,'Tribute to Johnny Green'). Broadcast September 5, 1949Series subtitle: The Railroad Summer Show. Cast: Jack Arthur, Gordon MacRae, Lucille Norman, Ted Osbourne and The Sportsmen Quartet. Based on the 1903 stage musical of the same name, which premiered at the Majestic Theatre on January 21, 1903, and the MGM movie of the same name, which premiered August 15, 1939 at Grauman’s Chinese Theater in Hollywood. Music score (from the movie) by Harold Arlen and E. ‘Yip’ Harburg (screenplay by Noel Langley, Florence Ryerson and Edgar Allan Woolf), adapted from the 1899 novel by Frank L. Baum. Music score (from the stage play) by A. Baldwin Sloane and Paul Tiejens, with lyrics and book by Frank L. Baum. Songs include: Stormy Weather; I’ve Got the Whole World on a String; Let’s Fall in Love; Ac-cent-thcu-ate the Positive; That Old Black Magic; Get Happy; It’s Only a Paper Moon; Blues in the Night; I Love a Parade; We’re Off to See the Wizard; Over the Rainbow; and Stardust (preview of next week’s broadcast, Hoagy Carmichael). Broadcast September 12, 1949Series subtitle: The Railroad Summer Show. Cast: Willis Bouchey, Jack Edwards, Frances Langford, Gordon MacRae, Lucille Norman and The Sportsmen Quartet. Songs include: Two Sleepy People; Georgia on My Mind; Ole’ Rockin’ Chair; Up a Lazy River; I Get Along Without You Very Well; Old Buttermilk Sky; It Couldn’t Be True; Little Old Lady; Lazy Bones (by Johnny Mercer); Stardust; and Temptation (preview of next week’s broadcast, a salute to Nacio Herb Brown). Series subtitle: The Railroad Summer Show. Cast: Celeste Holm, Gordon MacRae, Lucille Norman and The Sportsmen Quartet. Songs include: Younger Than Springtime; A Wonderful Guy; If I Loved You; June is Bustin’ Out All Over; It Might as Well be Spring; A Fellow Needs a Girl; Many a New Day; People Will Say We’re in Love; and Ol’ Man River (preview of next week’s broadcast, “Show Boat”). Episode #59 “THE VAGABOND KING” Broadcast November 14, 1949Cast: Francis X. Bushman (King Louis XVI), Evelyn Case (Huguette), Gordon MacRae (Francois Villon) and Lucille Norman (Katherine). Songs include: Song of the Vagabonds (MacRae and chorus); Some Day (Norman and MacRae); Only a Rose (Norman and MacRae); Only a Rose (Norman, MacRae and chorus); Tomorrow (Norman and MacRae); Huguette’s Waltz (Smith); Love Me Tonight (Norman and MacRae); and Only a Rose (reprise with Norman, MacRae and chorus). Trivia, etc. The 1949 version of "The Vagabond King" was a repeat of a prior episode, episode seven, originally presented in the 45 minute format on November 15, 1948. This version was only 30 minutes. The Billy Rose Theater Collection located at the Lincoln Center of Performing Arts in the New York Public Library holds the Jerome Lawrence and Robert E. Lee Collection, which includes a broad sampling of the material that the team created for radio, television, and the stage. Included in the collection are complete holdings for The Railroad Hour, both recordings and scripts. These include almost the entire run of The Railroad Hour, all off-line recordings from KFI in Los Angeles, California. Each recording is complete on two sound discs, analog, 33 1/3 RPM., 16 inch aluminum-based acetate discs. Access to many of the original items (such as transcription discs) is restricted. Many of the broadcasts, thankfully, have been transferred to sound tape reels (analog, 7.5 IPS, 7 in.) so patrons can listen and enjoy the musicals. In 1967, they presented a full collection of Railroad Hour recordings to the Rodgers and Hammerstein Archives of Recorded Sound at the New York Public Library. The Jerome Lawrence and Robert E. Lee Collection may or may not be complete. According to their inventory, the collection holds a total of 532 sound recordings – not all of them are The Railroad Hour. While the archive does house one rehearsal recording, the list of titles and broadcast dates remain incomplete. Comparing the library’s inventory with the recordings known to circulate among old-time radio collectors, it is estimated that about six recordings remain unaccounted for. Dismal hopes should not prevail, as it is “assumed” (but not proven) that the Lawrence and Lee Collection does contain a recording of every broadcast – and that the inventory sheets are merely incomplete. So the recordings listed above are referred to as "lost" only in the sense that they are not available in collector hands. In a future blog post I will list those six in particular. But in the meantime, if you have any of the above, please let me know so I can remove them from this list. Shameless plug: Material included in this blog post originates from The Railroad Hour by Gerald D. Wilson and Martin Grams. Reprinted with permission from Bear Manor Media. Special thanks to the staff of Ohio State University Library and the staff at the Billy Rose Theater Collection. Also special thanks to Ben Ohmart, Derek Tague, Joyce Comeaux, Kara Darling of the Rodgers and Hammerstein Theatre Library, Aida Garcia-Cole of G. Schirmer, Inc., Jim Cox, Leo Gawroniak, Terry Salomonson, Amanda Dittoe, Craig Wichman, Sheila MacRae Wayne, Al Hubin, B. Ray Druian, Jack French, Harlan Zinck, Roy Moore, Kathy Dragon Henn, David Goldin and Alex Daoundakis. I hate this show. Wouldn't bother me if the whole series was lost. Once again someone who prefers anonymous displays ignorance. As a faithful reader of your column, Martin, you will notice how I repeatedly point out the veil of anonymity coming from the same person who avoids a proactive approach to preserving old-time radio. I was able to track down who this anonymous is. Contact me for the information. You may want to consider altering your comments section so idiots like Tony above will be forced to disclose their identity or not post at all.